DIE Mercurii, 21 die Novembris. His Majesty's Pleasure to be known concerning it. Bill to prevent the Importation of Irish Cattle, &c.
Bp. of Hereford, Thanks for his Sermon on the Thanksgiving day. The Lord Chamberlain reported, "That, according to their Lordships Command, he had attended the King, to know what Time the Select Committees of both Houses might wait on Him, to present the Thanks of both Houses, for His issuing forth His Proclamations and other Orders against the Papists; and His Majesty hath appointed this Afternoon, at Three of the Clock, for that Purpose." To let them know, that the King hath appointed this Afternoon, at Three of the Clock, for the Select Committees of both Houses to attend Him at Whitehall, to present the humble Thanks of both Houses, for His Majesty's issuing out the Proclamation against the Papists. Hodie 1a vice lecta est Billa, "An Act for encouraging of Coinage." The Lord Treasurer and the Lord Ashley are appointed by this House to acquaint the King with this Bill; and to know whether this Bill hath His Approbation, because it is conceived that His Majesty's Prerogative is highly concerned therein. 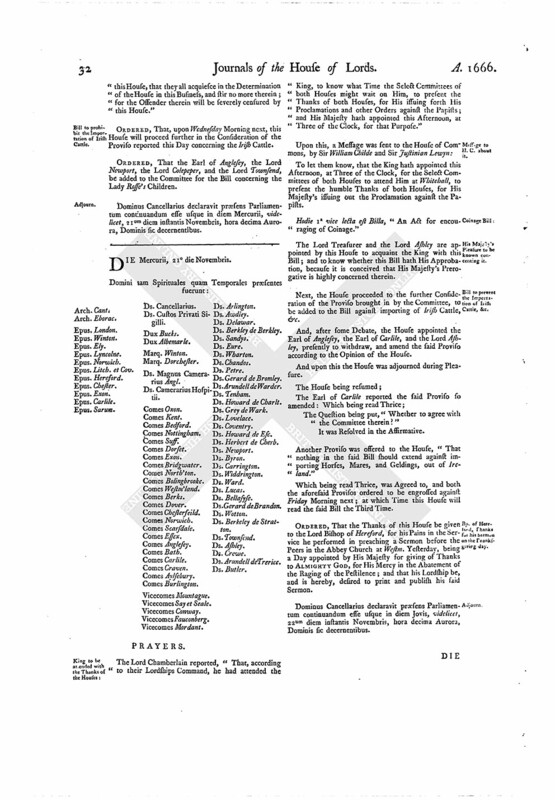 Next, the House proceeded to the further Consideration of the Proviso brought in by the Committee, to be added to the Bill against importing of Irish Cattle, &c.
And, after some Debate, the House appointed the Earl of Anglesey, the Earl of Carlile, and the Lord Ashley, presently to withdraw, and amend the said Proviso according to the Opinion of the House. And upon this the House was adjourned during Pleasure. The Question being put, "Whether to agree with the Committee therein?" Another Proviso was offered to the House, "That nothing in the said Bill should extend against importing Horses, Mares, and Geldings, out of Ireland." Which being read Thrice, was Agreed to, and both the aforesaid Provisos ordered to be engrossed against Friday Morning next; at which Time this House will read the said Bill the Third Time. ORDERED, That the Thanks of this House be given to the Lord Bishop of Hereford, for his Pains in the Service he performed in preaching a Sermon before the Peers in the Abbey Church at Westm. Yesterday, being a Day appointed by His Majesty for giving of Thanks to ALMIGHTY GOD, for His Mercy in the Abatement of the Raging of the Pestilence; and that his Lordship be, and is hereby, desired to print and publish his said Sermon. Dominus Cancellarius declaravit præsens Parliamentum continuandum esse usque in diem Jovis, videlicet, 22um diem instantis Novembris, hora decima Aurora, Dominis sic decernentibus.